The last two decades have witnessed a complete transformation in the manner cricket is played as a sport. While some changes have been revolutionary for the betterment of the sport the others have been more of a marketing gimmick to garner popularity among the fans. The inception of colored clothing, the white ball, day and night cricket, third umpire and decision review systems, T-20 leagues, field restrictions, pinch hitting and power plays have all played a significant role in redefining the way the game is played. But one change which has certainly made the sport more competitive from a playing perspective is the ever rising bar of fielding standards. Fielding is no longer seen as an ancillary dimension of the game but has surely become an integral part of the sport. Good all-rounder fielding has become one of the key ingredients to be a successful cricket team. All international teams constantly endeavor to improve on the fielding aspect of the game. The practice drills around throwing, catching and diving combined with strength and speed training’s have led to leaner and meaner fielders in the modern Era. With the advent of T-20 Cricket, the standards of fielding have scaled new heights with teams not giving an inch to their opponents in scoring easy runs on the field. All the top sides have a designated fielding coach who have their task cut out to fine tune and hone the fielding skills of every member in the squad. So how about compiling a list of the top 5 international sides who possessed the best fielding units in limited overs cricket since the 90’s. It may be noteworthy that the top five sides which have made the cut have not been chosen merely on individual brilliance’s but on collective fielding efforts put in by the entire team over a considerable period of time in limited overs arena. The South African team post their readmission to international cricket under the aegis of Hansie Cronje could be hailed as the first side which gave fielding a professional dimension. The Proteas were a cut above the rest when it came to their work ethics, fitness levels and spectacular display of athleticism on the field. They were perhaps blessed with arguably the greatest fielder the sport has ever witnessed in Jonty Rhodes. Rhodes was simply a live wire on the field who brought in that element of unparalleled agility, lighting quick reflexes and supreme fitness to take fielding to another level. His brilliant catching, sensational diving and lightning quick reflexes made him a standout fielder of his era. The Proteas also had the likes of Derek Crookes, Daryll Cullinan and Adam Bacher who were sharp fielders in their own right. The big burly allrounder Brian McMillian popularly nicknamed “Buckets” owing to his big hands was one of the safest slip fielders. Meanwhile seasoned seamers Allan Donald, Fanie De Villiers and Lance Klusener with powerful arms hurled rocket like throws from the deep. In the Pollock-Smith era, Herchelle Gibbs was second to none when it came to natural fielding abilities. Gibbs was an ideal successor to Rhodes and made fielding look remarkably easy with his supreme fitness. It was a real treat to see both Rhodes and Gibbs form an impregnable ring in the covers and point region which the best batsmen could not breach. Proteas greatest all-rounder Jaques Kallis was one of the safest slip catchers in world cricket for almost two decades. Their long standing skipper Graeme Smith was a handy slip fielder too. The Proteas are arguably one of the best fielding at present. Led by the multi talented cricketing genius AB De Villiers who is breathtaking with his astonishing athleticism and fitness, the South Africans have a plethora of naturally gifted athletes in Faf Du Plesis, JP Duminy and David Miller who are marvelous fielders in their own right. Meanwhile Dale Steyn, Morne Morkel and Chris Morris have the knack of pulling off some sensational catches in the deep. Hence the South Africans have to be awarded the Numero Uno position when it comes to their spectacular fielding considering the teams they have fielded with great fielders over a long period of time. How can one leave behind the Aussies when an element of fitness is attached to any sport. Fielding comes very naturally to the Australian blokes who have this natural affinity towards physical fitness and eagerness to play multiple outdoor sports from a very young age. The Australian team practices its fielding drills rigorously and the high standards of fielding by the Aussies have been an integral part of this noteworthy cricketing success. The Aussies were perhaps the first international side to leave an impression with their sensational fielding with the likes of Allan Border, David Boon and Dean Jones showcasing high levels of commitment in fielding at a time when fielding wasn’t taken very seriously by other cricketing nations. The Taylor-Waugh Era saw the brilliant slip trio of Mark Waugh, Shane Warne and Mark Taylor leave a mark for themselves as being the safest slip cordon. Mark Waugh with his razor sharp reflexes was an exceptional close in fielder too. Michael Bevan was lighting quick across the field much like his running between the wickets. Aussie great Ricky Ponting became Australia’s answer to Jonty Rhodes in guarding the backward point region. An extremely agile Ponting was known for pulling off some sensational catches and had a dead accurate arm which resulted in jaw dropping runouts. Andrew Symonds was another brilliant all-round fielder who was immensely athletic courtesy his trainings with the rugby team. Seasoned pacers Brett Lee and Mitchell Johnson were quick across the turf in saving boundaries and hurled rocket like throws from the deep. To round off the power packed list, Michael Hussey, Damien Martyn, Shane Watson and Justin Langer were sharp fielders in their own right. In recent times, the Aussies had the luxury of Michael Clarke and Steven Smith who both have been brilliant fielders within the 30 yard circle. Meanwhile Glen Maxwell, David Warner and Mitchell Starc are lighting quick across the turf with powerful throwing arms thereby patrolling the outfield well. The Australians surely take pride in producing sensational fielders who have swung many a matches in their favour through moments of brilliance on the field.. The Indian fielding has improved by leaps and bounds over the last two decades and turned into an extremely competitive fielding unit. In the 90s, the Indian team was much below par than their Aussies and Proteas counterparts although they had a few exceptional fielders. India’s legendary all-rounder Kapil Dev was naturally gifted with immense athletic ability which turned him into a great fielder of his generation. Their skipper Mohammad Azharuddin was one of the best slip and close-in fielders of that era. Azhar an extremely fit cricketer, was a brilliant slip fielder and had the ability to pull of some sensational run-outs. His flick throw became a signature style of his spectacular ground fielding. The ever smiling Ajay Jadeja was India’s fittest cricketer of that era and a brilliant fielder with great anticipation at the point region. Jadeja used his athleticism to great effect in pulling off some spectacular catches. Talk about sheer commitment and work ethics, the name Robin Singh comes straight to one’s mind. A late entrant to the Indian team, Robin impressed one and all with his superlative fielding. Jadeja and Robin Singh never shied away from putting in a dive when the others hesitated to do so. The Ganguly Era saw a real transformation in India’s approach towards fielding. Yuvraj Singh and Mohammad Kaif infused that spirit of energy into the India’s team with their splendid display of fielding. Kaif and Yuvi were naturally athletic, highly spirited and laid a lot of emphasis on their fitness regimen. The results were clearly visible through some spell bounding fielding efforts which turned around many a matches for the Indian team. Rahul Dravid was India’s best slip and close-in fielder courtesy his brilliant reflexes, high levels of concentration and good catching ability. The wiry Ajit Agarkar was a very handy fielder in the deep with a powerful arm which deceived many batsmen. The Indian team at present is a brilliant collective fielding unit owing to a bunch of youngsters who display a high sense of energy and enthusiasm while fielding. The team has guarded each of its key positions with specialist fielders. Talk about reflexes and speed across the turf Suresh Raina, Virat Kohli, Ravinder Jadeja and Ajinkya Rahane are the best in the world at covers or the point region. The slip cordon looks safe with Ajinkya Rahane, Rohit Sharma and Ravinchandran Ashwin who have safe pair of hands. Meanwhile the likes of Shikar Dhawan and youngster Hardik Pandya are a bundle of energy on the field with their supreme fitness levels and athletic abilities. The Kiwis have always been among the best sides in the world when it comes to fielding. The New Zealanders have been known for their keenness to compete hard with their all-rounder fielding abilities. With the Kiwis, what stood out distinctly in their fielding was that they never had one or two outstanding fielders but grouped well as a team to become a highly disciplined fielding outfit. Across three decades they have come across as a combative fielding unit, known to set some unorthodox yet attacking fielding positions. The Black Caps bring that natural athleticism to cricket from a very strong rugby culture back home. Over the years, the Kiwis had some brilliant fielders in Chris Harris, Lou Vincent, Daniel Vettori and Craig McMillan. Chris Harris stood out among his peers as an exceptional fielder who was like a dynamite at the point and covers region. In the 90’s, the Kiwis had a very safe slip cordon with exceptional slip fielders in Nathan Astle, Scott Stryis and Stephen Fleming who pulled off catches from thin air. Meanwhile the likes of Chris Cairns, Shane Bond and Jacob Oram were effective fielders in patrolling the boundary. Brendon McCullum was perhaps the most natural athlete to come out of New Zealand. Apart from his acrobatic wicket keeping, Baz was a superb fielder courtesy his razor sharp reflexes and instinctive abilities to attack the ball. He leapt like a tiger across the field and pulled off some sensational catches. The present Kiwi team are right up there with the best fielding teams in the world. They have some exceptional fielders in Martin Guptill, Ross Taylor, Nathan McCullum and Kane Williamson who can field well at all positions. Meanwhile Tim Southee, Corey Anderson,Trent Boult and Adam Milne are handy fielders in the deep with strong throwing arms. The Zimbabweans often find themselves at the bottom of the table when it comes to ranking international cricket teams on cricketing pedigree, but when it comes to fielding the Zimbabweans have always been among the best in the world. The Zimbabweans caught everyone’s eye in the 1992 World Cup with their stellar fielding performance. All through the 90’s they were a strong fielding outfit who raised the bar of fielding standards, much like their African counterparts the Proteas. Alastair Campbell was one of the finest slip catchers in the 90’s. Meanwhile Grant Flower, Stuart Carlisle, Guy Whittall, Paul Strang, Craig Wishart and Heath Streak were brilliant fielders who contributed in making them a star studded fielding team. The Zimbabweans created a mark for themselves through their combative and aggressive fielding tactics which made them a tough opponent for any side in limited overs cricket. The legacy of their great fielding tradition followed in the new millennium with the likes of Elton Chigumbura, Dion Ibrahim, Prosper Utseya and CJ Chibhabha who all are superb fielders in their own right. In my opinion Sri Lanka would be a little hard done by not making it to the top five, but the Islanders have produced some exeptional fielders over the years. 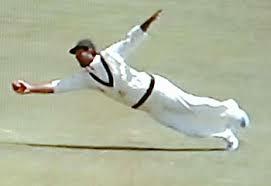 The other test nations have also produced some fielding greats who have caught the eye of the cricket fans through some spectacular fielding but haven’t been rated among the top five nations as they did not have a group of fielders at any one point in time which could lift the overall fielding levels of the entire team. Before I conclude, I have listed down the names of some of the outstanding fielders who were among the best in the world among their counterparts. Hope you all enjoyed reading my article on the top fielding sides and hope you would draw a consensus on the Top 5 sides that made the cut.